"The festival will take place from March 8 to 13 at the three temples to respect the Mother of Water religion and popularise it among the Vietnamese people," To Hoang Linh, chairman of Tuyen Quang People’s Committee, said at the press conference in Ha Noi. 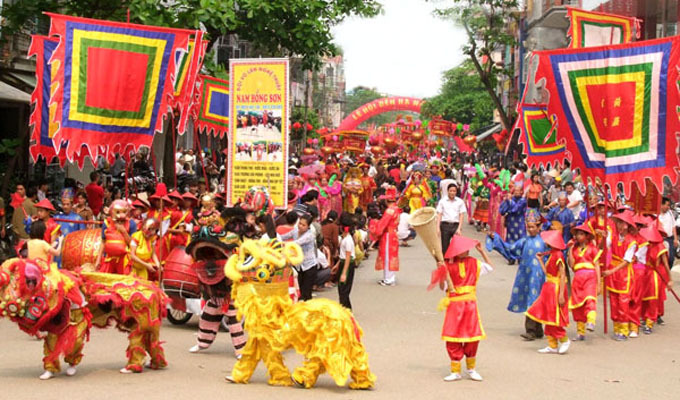 Ha Temple-Thuong Temple-Y La Temple Festival will be held on a grand scale in the northern province of Tuyen Quang to mark it being recognised as a national festival. "Mother Goddess, representing the three realms of the universe – Heaven, Water and Mountain -- is the most important religion in Viet Nam. The traditional festival honouring Mother of Water is being organised by Tuyen Quang Province to preserve and develop national relic sites. The province wants to popularise the festival to attract tourists and promote the tourism economy," the chairman said. The festival will open at the Ha Temple in Tan Quang Commune with a ceremony and festive activities, such as a water procession, release of lanterns, performances of rituals and a culinary contest, as well as a photo exhibition, circus, water puppetry and folk games. Ha Temple and Thuong Temple were built in 1738 and 1767, respectively, and are dedicated to Princess Phương Dung and Princess Ngoc Lan -- Hung King’s daughters. The festival was revived in 2007 and is being held every year since then.